The close of every year typically involves reflection on the year just past and making adjustments as we look ahead. At my age, I have come to appreciate the futility of New Year’s resolutions, having broken so many of them through the years. But our speaker at church Sunday issued a different sort of challenge for the new year. Rather than establishing a list of resolutions which normally are abandoned by March, he suggested we each adopt a one-word resolution for 2018. This is certainly not a new concept – it has become a fashionable trend in recent years. The idea is to identify one word to focus on throughout the new year. A word that will help mold you into the person you want to become in 2018 and, more importantly, into the person God wants you to become – more like Christ. Almost immediately, God planted one word in my mind. My word for 2018 is mindful. As I ponder all the ways in which I need to be more mindful, three areas come to mind. 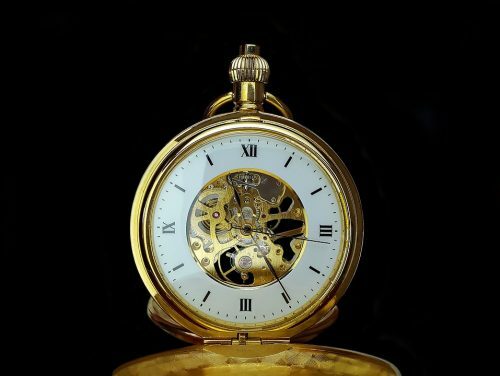 The first one, and the focus of this post, is to be more mindful of my time in 2018, both in terms of years and in how I spend the hours in any given day. While watching recaps of all the celebrities who died in 2017, my attention was drawn to their ages at the time of death. I couldn’t help but notice how much closer those numbers are getting to my own age. In fact, too many of them were younger than me. This year marks fifty years since I graduated from high school. As I received my diploma that night and contemplated the future, fifty years must have seemed like an eternity. Looking back, it’s difficult to comprehend how fast they have flown by. Evil time bandits lurk around every corner, often masked as pleasing but addictive entertainment. Many of us are amusing ourselves to death and wasting precious opportunities to truly make a difference with the life God has granted us. And so, I intend to be more mindful of my time in 2018 and I trust that will be evident in the frequency and quality of my posts. Speaking of time, I suppose I’ve taken enough of yours. I’ll save the rest of my thoughts on mindfulness for future posts. Perhaps some of you are thinking of a word to focus on in 2018. I would love to hear them. Feel free to share in the comments below or on social media. I vividly recall my first day working in my father’s cotton fields. When I was around eight years old, Daddy decided it was time I learned how to “chop cotton”. After he shortened the handle of my own personal hoe, I crawled into the back of our 1950 Chevy pickup truck along with several other workers and we headed to the field just above our house. 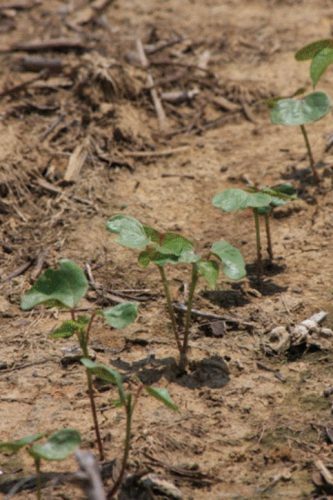 For those of you unfamiliar with the term, chopping cotton is the first hoeing that occurs after the young cotton plants become sturdy enough to withstand the process. It involves thinning out excess plants, leaving groups of two or three spaced apart by about the width of the hoe blade. The crusty soil is then tilled with the hoe and gathered to reinforce the remaining plants while removing various weeds, such as Johnson grass, coffee weeds, and thorns. The end result is similar to the photo shown here. I was actually pretty excited over the thoughts of spending the day working alongside my father and maybe earning a little spending money. The prevailing wage for chopping cotton at the time was $3/day. (I soon discovered to my dismay that it did not apply to family members!) However, the excitement I felt that morning quickly faded as the heat of the midday Georgia sun began to take its toll and the length of the rows increased, taking us far from the next refreshing drink from the communal water jug. 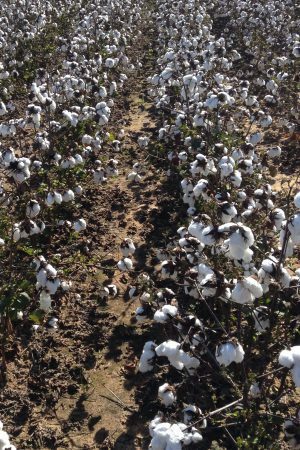 A few weeks later, we would return to the fields to remove any additional weeds that had sprouted up around the cotton plants since the initial chopping. Daddy would then plow the ground between the rows one last time and speak those words that soon became music to my ears, declaring the crop to be “laid by”, meaning work in the cotton fields was complete until the harvest. Little did I know at the time that I was learning a foundational Biblical principle found in Jesus’ Parable of the Sower. We spent many hours in those fields removing weeds that if left unattended would have choked the young cotton plants and greatly reduced the yield at harvest time. Thanks to meticulous soil preparation and timely hoeing and plowing, Daddy rarely failed to achieve his goal of harvesting at least a bale (500 lbs.) of cotton per acre planted. In the Parable of the Weeds, also found in Matthew 13, our Lord revealed Satan as the sower of weeds designed to make our lives unfruitful. Those weeds may be sins that entangle us, restricting our spiritual growth, and hindering our testimony. (Heb. 12:1) They usually involve activities more aligned with the world’s values than with God’s. Weeds may be nothing more than trivial pursuits which keep us from setting aside a daily quiet time of spiritual refreshment alone with the Lord, praying and studying His Word. In this day of 200 television stations available 24 hours a day with a simple click of the remote control, and smartphones beckoning us to check out the latest text message, tweet, or Facebook post, we are bombarded with more potential distractions than ever before. Ephesians 5:15-16 (ESV) says “Look carefully then how you walk, not as unwise but as wise, making the best use of the time, because the days are evil.” No matter where you are in your spiritual walk, you will always encounter those weeds that can choke the impact of the gospel and make you unfruitful. In fact, the stronger we grow in our relationship with the Lord, the more weeds Satan seems to sow. You will never hear the Lord declare you “laid by” until the day he calls you home. The work we’ve been called to do is too important and the enemy is too formidable. What people, places, or activities take up the space in your life that is meant for God? Is it time for you to start chopping? Note: All Scripture from the New International Version (NIV) unless otherwise noted.